Adell initially came to see me for a consultation to discuss concerns about her smile. 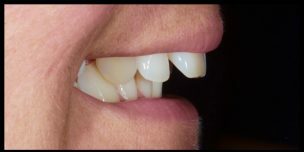 She was unhappy with the appearance of her ‘prominent’ and ‘gappy’ upper front teeth and wanted to discuss her options. A comprehensive dental and orthodontic examination was carried out and the full series of IAS photographic views recorded. •	Spacing >10mm in upper labial and buccal segments with missing upper 5s. A full discussion was then carried out explaining to Adell the options available to meet her treatment goals. I explained to her given the marked class II div 1 malocclusion a specialist ortho referral could be made to consider fixed appliance treatment. Adell was not keen to wear a fixed appliance and wanted to focus on a more flexible solution given her busy working lifestyle. PVS imps of both arches, a bite registration and clinical photos were sent along with a prescription to the IAS lab. An ArchWize 3D plan was then sent to be 6 days after sending the impressions which I approved following review. The ArchWize shows the proposed final position of the teeth after anterior alignment and gives a visual ‘mock up’ of the before and after. 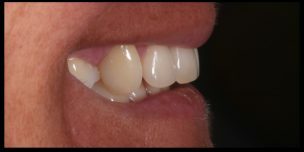 The Inman Aligner was then sent back to me the following week and fitted for the patient. The total IPR figure was very low at just 0.90mm as spacing was already present. I did half of the total IPR at the first appointment and placed a composite ‘anchor’ on UL2 which was the most ‘in-standing’ and palatally crowded tooth. The patient was reviewed at 2 weekly intervals for further IPR and replacement of composite anchors as needed. 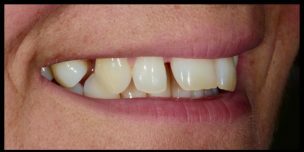 Occlusal and retracted photographic views were recorded at each review appointment to which acts as a valuable tool in achieveing good patient compliance and progressing the case more efficiently. A significant reduction in the overjet and closure of spacing was achieved over 12 weeks by retracting the central incisors and providing mild tipping of the UL2. I followed up with some external tooth whitening over 2-week using 10% carbamide peroxide. 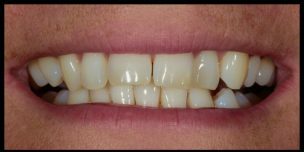 Retention was maintained using the inman aligner during the whitening phase of the treatment. 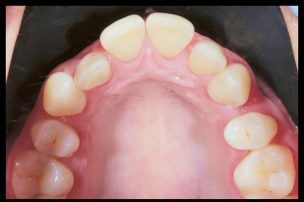 A bonded retainer was then placed at the 2-week polishing/review appointment and an Essix retainer provided. 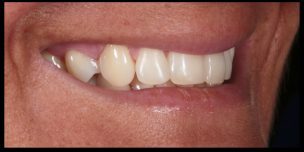 Adell was pleasantly surprised with the finished outcome of her treatment and impressed at how close to the 3D Archwize model the finished result was! 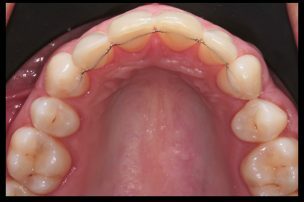 The IAS ethos of providing minimally invasive orthodontic treatment allows GDPs to treat cases like Adell’s with predictability and in a very well supported system. The online support I have received since completing the IAS Inman Aligner course 3 years ago has been second to none and pivotal in allowing me to treat a wider variety of anterior alignment cases. 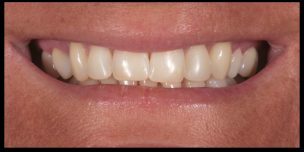 The potential of the Inman Aligner combined with bleaching and bonding techniques has transformed my own clinical practice and for patients seeking cosmetic smile improvements. I would like to thank the IAS mentors and lab team for their continued help and support as without them I can’t deliver the high-quality cases I aspire to achieve every time! I’d also like to thank Dr Monik Vasant for his continued feedback and mentoring in helping me improve my composite bonding skills. His course allowed me to put the crucial finishing touches in my anterior alignment cases and has truly been a game changer! Thanks also to all the team at Thornaby Dental who work so hard and support me daily.